Scientists with NASA’s planet-hunting Transiting Exoplanet Survey Satellite (TESS) mission recently released images from the spacecraft’s first science orbit. The mission’s “first light” image was a detailed picture of the southern sky taken with all four of the spacecraft’s wide-field cameras. 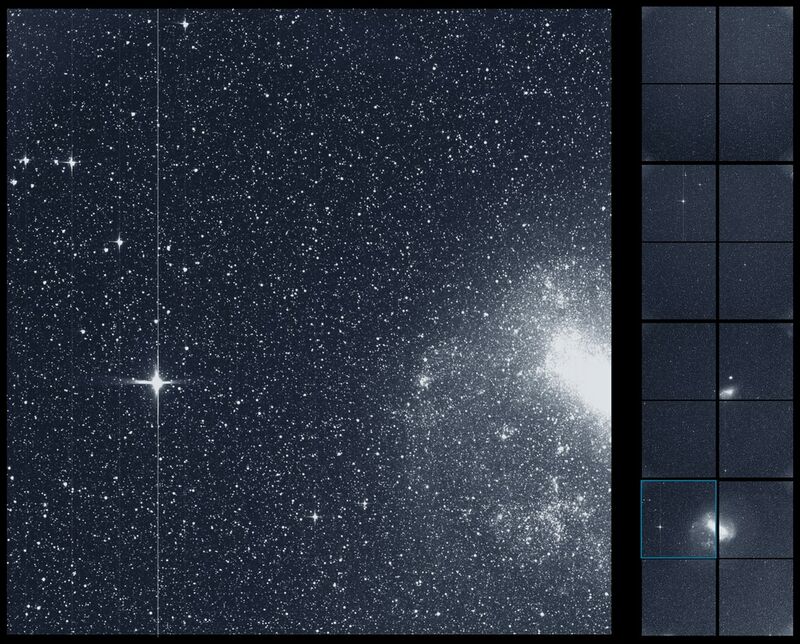 TESS captured the first light image during a 30-minutes observing period on Aug. 7, 2018. The black lines in the images are gaps between the camera detectors. Parts of dozens of constellations, from Capricornus to Pictor, appear in the images, as well as both the Large and Small Magellanic Clouds, the galaxies nearest to our own. “This swath of the sky’s southern hemisphere includes more than a dozen stars we know have transiting planets based on previous studies from ground observatories,” said George Ricker, TESS principal investigator at the Massachusetts Institute of Technology’s (MIT) Kavil Institute for Astrophysics and Space Research. TESS’s four cameras, designed and built by MIT’s Lincoln Laboratory and the MIT Kavil Institute, observe large patches of sky in search of transits. Transits occur when a planet passes in front of its star as viewed from the satellite’s perspective, causing a dip in the star’s brightness at regular intervals. On Sept. 19, the TESS mission team announced in a tweet the discovery of the mission’s first candidate, a super-Earth orbiting the bright star Pi Mensae, nearly 60 light-years from Earth. The planet orbits its star every 6.3 days. Then on Sept. 20, a second planet candidate was announced. This planet orbits LHS 3844, a M dwarf star 49 light-years away, every 11 hours. Both finds are currently being reviewed by other scientists. TESS will spend two years surveying 26 sectors of the sky for 27 days each, covering 85 percent of the sky. During its first year of operation, it will cover the 13 sectors of the southern sky. The spacecraft will turn its attention to the northern sky during its second year of science observations. The mission is continuing the planet-finding legacy of NASA’s Kepler spacecraft, which also uses the transit method to discover exoplanets. The stars that TESS targets are 30 to 300 light years away and about 30 to 1,000 times brighter than Kepler’s targets, which are 300 to 3,000 light years away. The brightness of TESS’s targets make them perfect candidates for follow-up study with spectroscopy, the study of how matter and light interact. The James Webb Space Telescope and other space and ground observatories will use spectroscopy to study properties of the planets TESS finds, including their atmospheric compositions, masses and densities. TESS launched from NASA’s Kennedy Space Center in Cape Canaveral, Florida, on April 18 atop a SpaceX Falcon 9 rocket and used a flyby of the Moon on May 17 to head toward its science orbit. It began collecting science data on July 25 following an extensive checkout period of its science instruments.